Over the past several years, FINRA has continued to demonstrate their focus on monitoring high-risk brokers. In 2017, FINRA approved new proposals to strengthen controls on high-risk brokers and further indicated it would be an ongoing priority in their 2018 Priorities Letter. FINRA and other regulators have announced the expectation of firms to adopt practices of “heightened supervision” in an attempt to isolate high-risk brokers and activities. These activities are often associated with financial crimes, which have become even more difficult to identify and intercept given today’s volume and variety of communications data. - What “heightened supervision” means for today’s communications compliance realities. - The challenges and the potential risks hidden inside of today’s non-email communication channels. 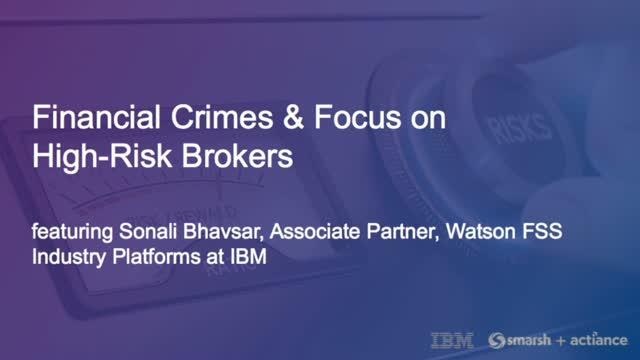 - How Smarsh and IBM can deliver surveillance insights from supervised content. And, that is just in the last 5 months! Today, compliance officers at broker-dealer and investment advisory firms are challenged by supervisory review like never before. The SEC/FINRA/IIROC scrutiny over supervisory practices has never been higher, while many firms continue to rely upon supervisory tools that were designed for email over a decade ago. As new electronic communication tools like instant messaging, social media, and text messaging have emerged, many highly regulated organizations have tried to prohibit their use at work. Meanwhile, employees in every industry are increasingly using their mobile devices and today’s unified communications and collaboration platforms to work on the go – tools like Microsoft Teams, Symphony, and Cisco Webex Teams. At the speed these channels are being adopted, forward-thinking organizations must take steps to enable both compliance and productivity – rather than choosing one or the other. Watch this webinar to discover how your organization can take proactive steps to enabling compliant productivity using today’s most in-demand communication and collaboration tools. - What compliant productivity means for you and your organization. - Why more organizations are enabling their employees to communicate and collaborate using modern tools. - Best practices for enabling productivity while fulfilling your organization’s record keeping obligations. Mobile devices are enabling firms to be more connected and productive than ever before. However, regulatory obligations and an unfamiliar compliant mobile technology stack mean that many firms continue to hold back from enabling their employees to use mobile messaging for business. Using mobile messaging to reach and attract younger, mobile-centric clients and advisors is becoming more necessary to adapt and stay competitive, and for forward-thinking firms, now is the time to learn how to build an effective mobile compliance program. With more options for communicating than ever before, leaving your firm’s regulatory compliance to chance with a policy of prohibition isn’t enough. As a proven compliance expert, Cheryl Ritchey of BBVA Compass has developed a proactive approach to supervision that enables her to be a pioneer in compliance as channels like web, collaboration platforms, instant messaging, and text messaging become a bigger part of the workplace. In the 2018 Electronic Communications Compliance Survey, we uncovered the greatest challenges facing compliance professionals today. Survey responses indicate that shifting workplace and investor demographics are driving firms to new communication channels, but their supervision policies and tools are struggling to keep pace. Retain critical information in a single secure, search-ready repository where it can be actively monitored and produced on-demand.